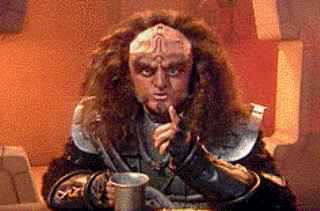 Interested in the Klingon language? Whether you are just using it for the occasional nuqneH, or youre a wanna-be serious student of the warrior tongue.  The Klingon Directory is produced by and is also known as tlhIngan Qummem. It lists Klingons and other aliens (including Terrans) who are interested in tlhIngan Hol. There is no discrimination and the directory order is purely down to first come first listed. TKD is independent of other clubs but does have a connection to one in particular, the Klingon Strike Force. However, some listees are not members of the KSF so ranks and status from that or any club are excluded from its listings. To help gauge the ability of the being you are writing/speaking to a self-assessed skill level is requested for inclusion. The intention is that beginners do not end up with passages or even complete letters without translations also being included. Please specify acceptable file type Not Interested Adobe Acrobat (pdf) Word XP 2003 Word XP Word 2000 Word 97 Word Pad (.wri) Rich Text Format (.RTF) TEXT (.txt) OTHER..
Woodside, Withycombe, Furzton, Milton Keynes, MK4 1ET, England, Earth.